“We found out that by using any key card to a hotel ... you can create a master key that can enter any room in the hotel. It doesn’t even have to be a valid card, it can be an expired one.” A minor technical design flaw device (en)ables (hackers) to write a master key out of the information of any card. 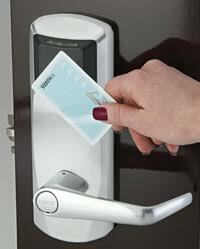 The radio-frequency ID key card system is still being used in several hundred thousand hotel rooms worldwide. By getting hold of a widely used hotel key card, an attacker could create a master key to unlock any room in the building without leaving a trace, Finnish security researchers said in a study, solving a 14-year-old mystery. While the researchers have fixed the flaw together with Assa Abloy, the world’s largest lock manufacturer which owns the system in question, the case serves as a wake-up call for the lodging industry to a problem that went undetected for years. Tomi Tuominen, 45, and Timo Hirvonen, 32, security consultants for Finnish data security company F-Secure (FSC1V.HE), say they discovered the vulnerability about a year ago, and reported it to Assa. “We found out that by using any key card to a hotel ... you can create a master key that can enter any room in the hotel. It doesn’t even have to be a valid card, it can be an expired one,” Hirvonen said in an interview. Any fresh security risk remains low since the researchers’ tools and method will not be published, Assa noted. The radio-frequency ID key card system in question, Vision by Vingcard, has been replaced by many hotels with new technology, but its current owner Assa Abloy (ASSAb.ST) estimated that the system is still being used in several hundred thousand hotel rooms worldwide. Sitting at F-Secure’s glass-and-steel-on-stilts headquarters by the Baltic Sea, the researchers show off a small hardware device which they have made able to write a master key out of the information of any card in the Vingcard system. Clues date back to 2003 when a laptop disappeared from a computer security expert’s room at a high-class hotel in Berlin. “These issues alone are not a problem, but once you combine those two things, it becomes exploitable,” Hirvonen said. “The challenge of the security business is that it is a moving target. What is secure at a point of time, is not 20 years later,” Christophe Sut, an executive at Assa Abloy Hospitality, said in a phone interview.